Is it becoming more common or am I just noticing something that I’ve overlooked previously? I’ve started to see cremation ashes more often at landmarks and beauty spots. The ashes aren’t obtrusive, but they’re unmistakable once you know what they look like. The other day I noticed some scattered near a bench on a hill. The bench must have been a favourite spot for the deceased person in life and that’s why they requested that their ashes be scattered there when they had passed on. It’s a very old tradition. 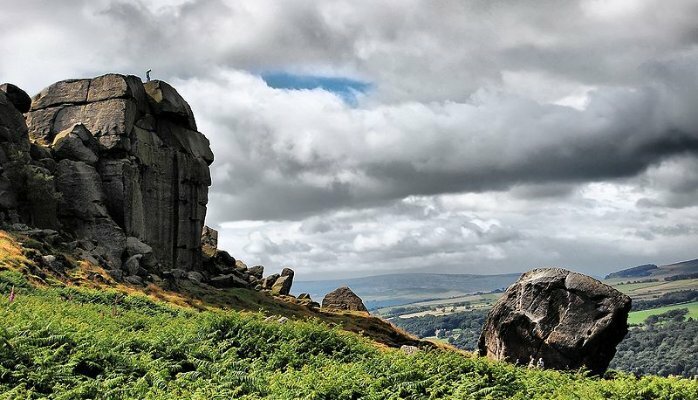 The playwright Alan Bennett tells a story about taking his aunt Myra to scatter her husband’s ashes at Ilkley Moor, one of Yorkshire’s most famous locations. And it wasn’t just anywhere on the Moor – she searched for a long time until she found a particular spot. That was in the 1970s and the tradition was hundreds or thousands of years old by then. Bennett went with his aunt because he was the only member of the family who could drive at the time. But when they arrived they found, as you might expect, that there were sightseers on the Moor. Bennett was embarrassed when his aunt showed no inhibitions about getting out of the car with the cremation urn under her arm and scattering the ashes in front of the sightseers, even as the wind blew some of the ashes over her clothing. “He didn’t want to leave me!” she said tearfully to her nephew when she got back to the car. Bennett didn’t respond very sympathetically at the time and says now that he regrets not being more understanding. The loss of a loved one, particularly a husband or wife, is a very difficult thing and his aunt was coping with it in the best way she could. She was also respecting the memory of her dead husband. He had chosen to be cremated and for his ashes to be scattered at a spot that was meaningful to them both. Because it was a public place, it wasn’t possible for a permanent memorial to be placed there. And maybe the husband didn’t want anything like that. Scattering ashes isn’t meant to be permanent and it isn’t meant to be highly visible. The ashes will soon be moved by the wind or washed away by rain, absorbed into the earth and lost from sight. But you don’t have to scatter the ashes of a deceased person, of course. The alternative is to have their ashes stored in an urn or other container. When you learn that a widow or widower has kept their late partner’s ashes like that, it can be an unsettling experience. Suddenly the urn seems different: it isn’t just a decorative thing. It has the remains of a human being inside it. This is a little like learning that a book or painting was owned by someone famous or infamous. It’s no longer an ordinary object: it has an aura with it. That’s why some people are two minds about the practice of scattering ashes. On the one hand, we know that the dead person wanted this to be done and was happy to think that their last remains would be in a spot that meant a lot to them during life. On the other hand, we’re suddenly taken out of the everyday when we’re see a drift of granular ashes by a bench or among the flowers in a park. The thought is inescapable: “That was a person once.” It’s not always comfortable to think that and some people try to take care not to tread on the ashes – I know I do. I want to show respect. The ashes aren’t unhygienic in any way: a cremation takes place at very high temperature and nothing could survive. But the ashes are still the remains of a person, and that gives them an inescapable power and meaning.